Get the Auto Close Timer Tool! This Tool allows you to close all order on a predefined time. You can choose whether you want to close trade only on the current Symbol or on all Symbols. You can also set multiple Magic Number to only close the trades with these specific Magic Numbers. Choose the Magic Number separated by commas. If this is empty the Auto Close Timer will close all position regardless their Magic Number. Choose wether this tool should be active or not. Choose the slippage in pips. Shows useful information about your current settings. This is an Expert Advisor. Put it in the /experts directory! 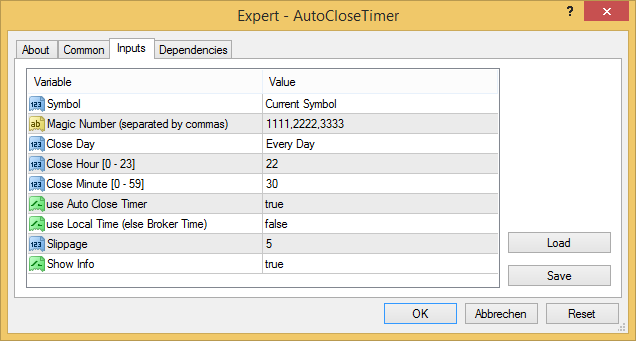 You can install the Auto Close Timer Tool on limitless demo and live accounts. 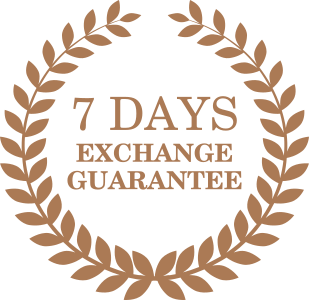 The license of every Metatrader Trading Tool you download is time limited, but you can re-download newer versions any time in your purchase history. can you add a selection function – “close only profitable orders”? This is a good idea. Not sure if I will implement it though. Can it close, as an example, at 4h after open or if the take profit gets first? No, it closes at a specific time, not x hours after a position was opened. can I have this active on just one chart in mt4 and it will close all open positions any many charts? Yes, if you set the first options to “All Symbols”. Do you plan to build a supply and demand ea? Thought about both. If I have time, I will make them.